A tangled trellis of vines forms the bars of this striking, large gothic cross. 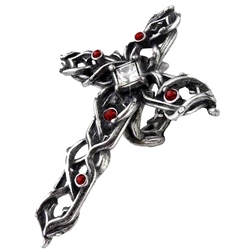 The Thorny Cross Handspan Ring is studded with blood red Swarovski crystals and a white, square crystal at the center point. The gothic ring fits around one finger so that the longer bar of the cross extends out over the other fingers on your hand. Crafted from the finest English pewter, the cross ring gleams in the light, the details emphasized with light blackening in the crevices. The beautiful design of this three finger ring makes it an eye-catching accessory for gothic attire.